The Museum & The "Old 300"
Where Were the Colonists From? 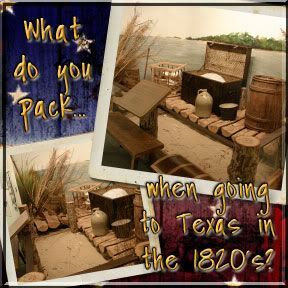 How Did the Colonists Get To Texas? 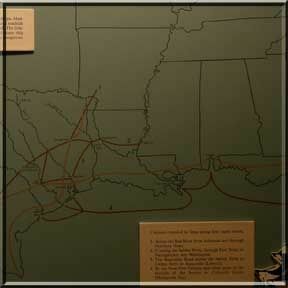 Pictured above is a diagram of the migrations of the "Old 300" to Texas. Some came by land, and some came by sea [or, rather, by the Gulf Of Mexico]. No matter which way they came, it was a rough ride, and when they got here, they found a very unforgiving land [as the first German immigrants would find out approximately 20 years later]. Also, pictured here is a diorama of what the colonists would've brought with them when coming via the Gulf of Mexico. So What Does This Have To Do With Richmond, Texas? A good question because if you'll notice, I haven't really mentioned Richmond in this whole explanation of the first colonists of Texas. If you take a close look at the map pictured below, you'll see that Richmond, Texas is on the Brazos River. 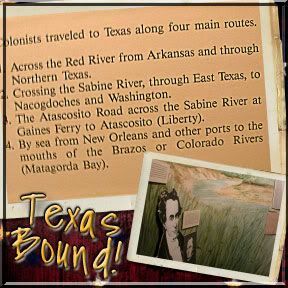 It is located in and is the county seat of Fort Bend County, but neither was formed and/or incorporated until 1836 [when Texas won her independence from Mexico, and the Republic of Texas was formed]. 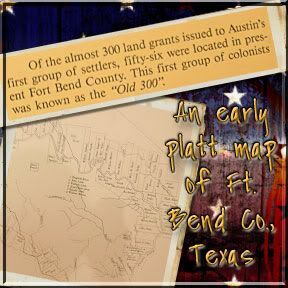 However, in the area that would become Fort Bend County, 56 families of the "Old 300" settled. In fact the "Fort" in Fort Bend comes from the term "Fort Settlement" which was the name of the the first 2-room cabin built in the area. The word "Bend" comes from the bend in the Brazos River that occurs in the county, which is shown in the map below. 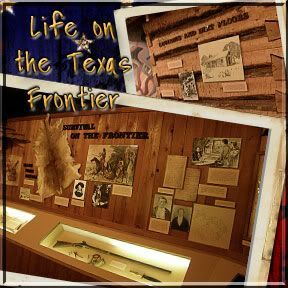 [Not really all that creative, but, hey, it stuck...] Also, the museum had an exhibit on the life on the Texas frontier pictured below. Notice how the logs are squared-off. This was essential because of the humidity. If left round, the moisture would collect in between the logs. So Were These Colonists Still American? Next post: The story of a woman who would later be known as "The Mother of Texas." Very excellent stories! 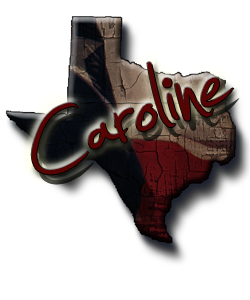 I have family and ancestors from Nacodoches, Milam, Nueces, Aransas, Midland, San Patricio, Gregg, Harris, Harrison, Travis, and Smith counties (in other words, all over!). 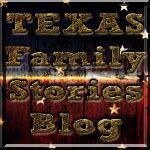 I look forward to reading more Texas family stories here. Very nice re-design - and I love the cowboys in the margin. As I look at this it's almost 11 p.m. and I'm bleary-eyed so I'll refrain from commenting on your article till I can read it with a clearer mind!